Do not adjust your computer – these are real pictures – and yes – that is a turkey leg scented air-freshener. What do turkey legs have to do with Disney? Click here to read more on the subject. Forget that new car smell! If you are a fan of not only the sights but the SMELLS of Disney this is for you!! 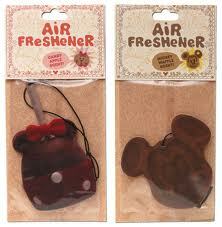 Disney has released these air fresheners to be purchased in Disney World and Disneyland. They have worked on them for a whole year and the last time I checked, they were still available for purchase in the parks. I’m not so sure the turkey leg smell is my thing. I imagine the dogs in the neighborhood might all want to break into my car. It’s OK though – there are other options. The ice cream freshener is scented to smell like (what else?) a Mickey Premium Ice Cream Bar. These are candy apple and mickey waffle scented – respectively. My experience with these kinds of fresheners is that the scent is really strong for the first day or so and then the rest of the month…it just makes for a cool decoration to hang from my rear-view mirror. 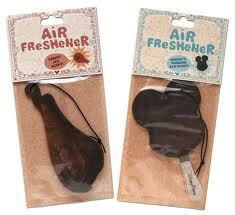 Could the Disney magic and pixie dust on these particular air fresheners prove me wrong this time? Perhaps I will buy a collection of them and at the end of the year when the smells are gone– there will be enough to decorate my Christmas tree! I bet my husband would love that – NOT. Just kidding, but you have to admit this is yet another creative idea from Disney and they ARE kinda cute! ← Send Friends and Family Your Own Crush Creation!